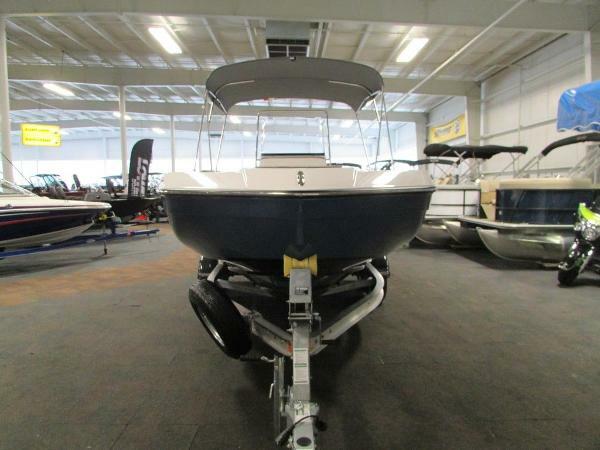 2019 Yamaha 210 FSH Deluxe PLEASE CONTACT FOR AVAILABILITY SAVE THOUSANDS ON THIS ALL NEW 2019 YAMAHA 210 FSH DELUXE CENTER CONSOLE! 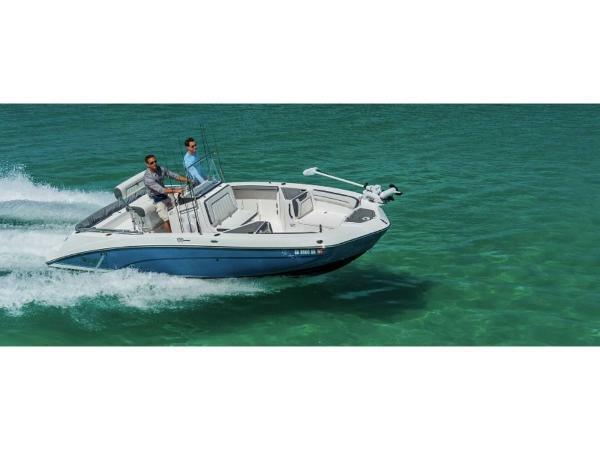 Put yourself in the center of Yamaha’s one-of-a-kind, fishing-friendly center console boat that is versatile enough for even treating your family to their favorite wakesports activities. 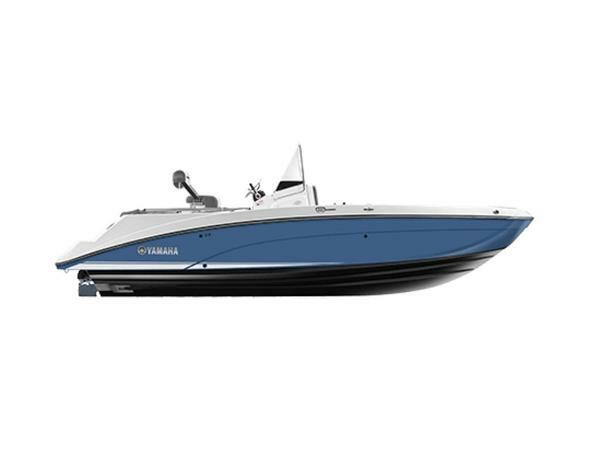 The compact design of Yamaha’s internal jet propulsion system results in an open, cross-functional platform with 360 degrees access to the water. With its 16” draft, shallow water navigation is a breeze in coastal and inland conditions. 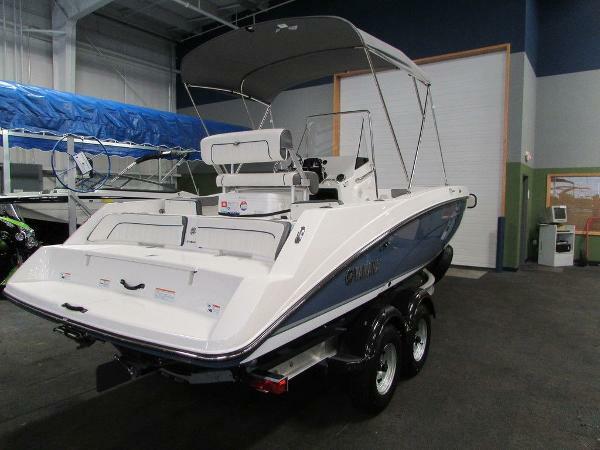 The family-friendly layout is packed with Yamaha-exclusive technology, plus key features for fishing including plenty of storage for rods, bait, tackle boxes, coolers, and anchors. 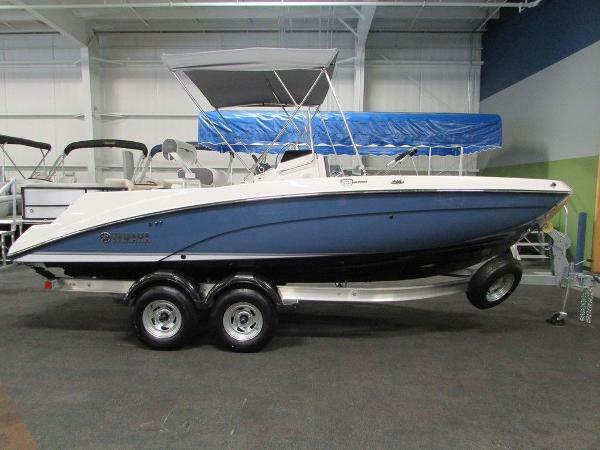 This boat is powered by twin 1,049cc 1.8 liter High Output Yamaha Marine engines. 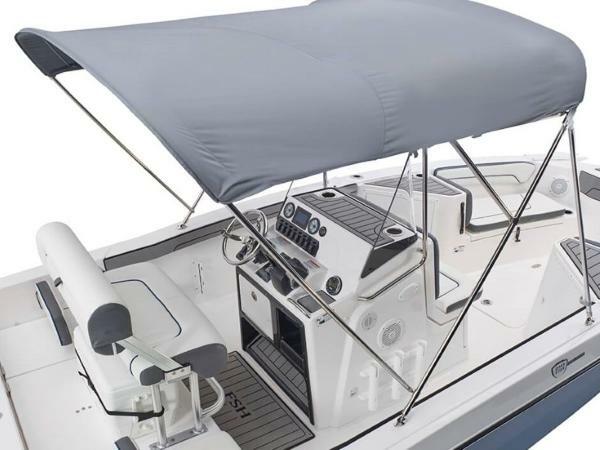 Standard features include: center console including; removable windshield, port and starboard side console vertical rod tubes, center console head w/padded front console seat (porta-pottie not included), and lockable storage compartment; removable bimini top w/storage boot, cockpit port and starboard rod storage racks w/tubes, dual analog tachometers and Connext digital information center, in-dash Ritchie compass, Clarion AM/FM Bluetooth stereo w/AUX and USB ports, Yamaha 3 position “No-Wake” mode and Cruise Assist system, “Jet Wash” raw water washdown system, articulating keel, auto bilge pump, blower, electric horn, navigation/anchor lights, courtesy lights, 12-volt power outlet, tilt steering wheel, bow seating w/under storage, bow anchor locker storage, bow in-floor storage, cockpit port and starboard storage compartments, coaming bolsters, driver’s bench seat w/reversible backrest, bring-aboard Igloo cooler, stern jump seats w/under storage, stern 26-gallon aerated livewell/baitwell, integrated swim platform including; padded backrests, telescoping boarding ladder, wet storage compartment, and tow hook; (8) gunwale rod holders, non-slip fiberglass flooring, beverage holders, passenger safety handles, stainless rubrail insert, (5) stainless pop-up mooring cleats, 50-gallon fuel tank, marine cranking battery, fire extinguisher, on-off battery switch, 10 person capacity, limited lifetime hull warranty and 1-year engine warranty. Also included is a Shorelandr tandem axle aluminum bunk trailer including: swing tongue, surge brakes, 14” wheels, spare tire mount w/matching spare tire, composite fenders w/steps, swivel jack, tie down straps, and bearing buddies. Trades will be considered and delivery is available. Competitive financing rates and terms are also available. Approximate payment of $374/mo. w/20% down for 144 mo. (WAC). Leaders RPM is one of the largest marine and powersports dealers in the Midwest with over 70,000 sq ft of showroom, parts, and service under one roof located in Kalamazoo, MI. Price is plus freight, prep, and sales tax/fees and is subject to change without notice. All rebates to dealer. CALL TODAY FOR OUR BEST PRICE! Item and price are good for a limited time or while supplies last and includes Leaders RPM's Preferred Customer Program (call for details). This is a BRAND NEW unit with full manufacturer’s warranty. Price includes dealer discounts PLUS any factory-to-dealer rebates. Competitive financing rates and terms are also available. Delivery is available and trades will be considered. Price is plus freight, prep, and sales tax/fees.